The Institute's Chairman, Giulio Tremonti, describes Aspenia thus: "A forum for transatlantic discussion, the journal reflects the fruitful relations that Aspen has established over the years and represents a meeting place between the business community and other worlds." 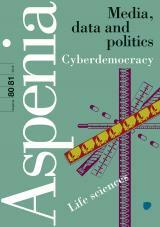 Aspenia is the only Italian journal to regularly address issues of transatlantic interest, offering significant political commentary on US-European relations. Its success comes from the adoption of a multidisciplinary approach to problems and from the long list of prestigious figures it counts among its authors. These contributors include: Giuliano Amato, Zbigniew Brzezinski, Carlo Azeglio Ciampi, Lawrence Freedman, Francis Fukuyama, Timothy Garton Ash, Bob Geldof, Bronislaw Geremek, Anthony Giddens, Samuel Huntington, Robert Kagan, Charles Kupchan, Gilles Kepel, Arrigo Levi, Kishore Mahbubani, Mario Monti, Condoleezza Rice, Jeffrey Sachs, Paolo Savona, Joseph Stiglitz, Strobe Talbott and Giulio Tremonti. According to Giuliano Amato, its founder, "Aspenia is a 'responsible' journal, which has succeeded in keeping up with history. None of the last decade's great questions is missing from the pages of Aspenia, ­and particular attention has been paid over the years to rising powers, to shifts in geopolitical balance and to the two great faultlines along which our recent history has unfolded: 1989 and 2001." Aspenia has intervened in many strategic questions, often forecasting political and economic changes and interpreting - as explained by Aspenia's Editor-in-Chief, Marta Dassù - "the post-Cold War transformation of the Western world." Published with Il Sole 24 ORE, the Italian version of Aspenia is distributed at newsstands and in bookstores throughout Italy. The English version comes out twice a year, consists of a selection of choice articles, and is distributed to think tanks, embassies and universities all over the world. For further information on Aspenia, please contact Gyneth Sick at the Aspen Institute Italia headquarters in Rome.